When Thomas Jefferson said that “All Men are created equal,” obviously diaper bags were not considered in the equation. It is a universal truth that not all men are capable of carrying bags featuring the emblems of feminity. Men, in general, would rather single-handedly fight a battalion of enemy soldiers rather than face the prospect of taking his baby out while carrying a diaper bag with oversized flowers and brilliant colors. If you see one dad scurrying around during a baby’s day out, there is a really big chance he is carrying the above mentioned bag. While so much fuss is created about women not having equal rights to so many things, which is also quite right, the poor men are left to the sidelines while waiting for the right diaper bags that would make them as comfortable as the women in showing their baby around. Good things indeed happen to those who wait for after centuries of enduring countless gapes and embarrassing stares, dads finally have the kind of manly diaper bags that would make them hold their heads high when doing their fatherly duties. Although it is not yet proven, there has to be a link between men and pockets. Studies show that 87% of men prefer things that have some sort of pocket in them. This is a good example of how men view the more the merrier adage. It means that dads have to give it careful thought about the number of pockets a manly diaper bag provides. The pockets should also be able to accommodate not just the baby things, but other essentials he needs to take along with the baby. Aside from the number of pockets available, the size does matter. Yes, you got that right. Size should be taken seriously in this case. For convenience the manly diaper bag must be able to hold baby bottles of varying shapes and sizes. Luckily, there are manly diaper bag options that feature pockets of different sizes for better versatility when it comes to bringing things. The straps, first of all, should be comfortable for you. While the issue of a diaper bag that looks manly enough has been solved, comfort has to be given prime importance as well. There are options on the market that feature straps with a good amount of cushioning. This kind of padded strap should make you even more comfortable while you carry that manly diaper bag. The straps should also be designed for convenience, especially when you need to use both hands. They should not hamper you when pushing the baby stroller or when you have to get hold of something. The best straps should not make you feel restricted, but should allow maximum movements. Style: Over 32 different styles. Stylish with great functionality describes perfectly this manly diaper bag. For starters, you can show off your favorite baseball team’s colors to everyone. If you do not have a preferred baseball team, the colors of the team representing your state is a very good option. To the nitty-gritty, this diaper bag is built to be slung across your shoulders using an adjustable and very well-padded strap. As such, this can be suited for dads of different sizes and is very comfortable when carried. Stroller straps are also included, which allow you to hang the diaper bag on the baby stroller. There are several pockets in this diaper bag that can hold several bottles and other baby things simultaneously. The pockets are functional, but do not offer you the best chance to organize things inside. This is suited best for quick travels since it is not that roomy compared to other options. If you want a larger diaper bag or one with the option for better organization of things, you might have to look at the other options below. 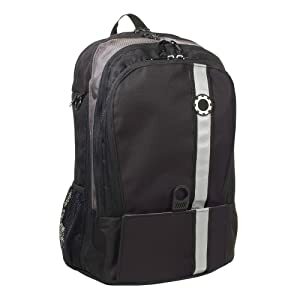 If the above mentioned model lacks the organizational features you need, then this backpack diaper bag is just what the doctor ordered for you. This bag is practically littered with pockets and compartments that allow you to store things in a very orderly manner. On top of this diaper bag is what the designers call a “hammock” as the storage area for the diapers. Below this hammock is the heart of the bag where you can even park your baby’s stroller. It has more than enough space to place all sorts of things inside. More importantly, once you open the zippers all the way, the bag can be fully laid out. The ability to see everything with a glance once the bag is fully open is handy for a dad that loves to be in control of things. There are also other compartments that necessitate quick access without unfolding the whole thing. One such sample of a compartment is the pocket for the baby wipes. Lastly, this diaper bag offers an assortment of styles that should fit your fashionable or cool preference. The Manly Backpack Diaper Bag is easily one of the most popular among dads on the market today. If the previous model can accommodate your baby’s stroller, this one can literally swallow your SUV and the parking lot in one go. This is so big that your wife will probably dismiss it right away due to sheer size. That may be so, but your manly bravado and the need for more things if you have twins or a couple of kids dictate that you should get one. For better reference this diaper bag can be draped across the back of a side by side double stroller. The Hold-It-All Diaper also gives you the chance to organize your things better compared to smaller diaper bags. It has several easy access points where you can store your most needed baby things. 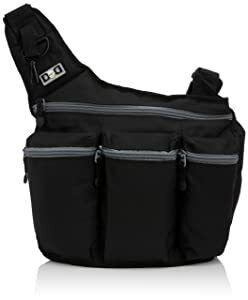 This diaper bag also comes in different color combinations, which includes a black-colored option that will be perfect for your alpha male aura. 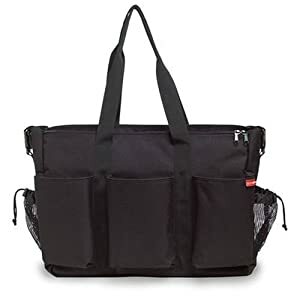 If you are the kind of dad who really loves this diaper bag even if you do not have twins or kids, your wife will seriously think you are planning to stuff her inside together with all the baby things. Seriously, this is as roomy as you can get in a diaper bag and highly durable at that. 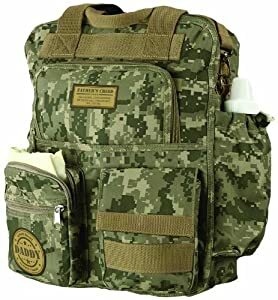 When in doubt about how to really show your manliness to other people, this Military Diaper Bag will shoot down those questioning looks with ease. A camouflage version of a diaper bag is certainly in line with your manliness. This is not just all looks though as the Military Diaper Bag has most of the best features that you are looking for in a diaper bag. It has more than enough pockets for a variety of things with different shapes and sizes, great fit and feel with the straps, and fairly durable. Another good thing going for this diaper bag is the ease of cleaning since it is mostly made of cotton and polyester. What it lacks in versatility as far as fashion goes is compensated for a badge that declares to all the world how seriously you take care of your baby and how important carrying a diaper bag is seen by a modern day hero. This diaper bag is quite possibly one of the most interesting options available. 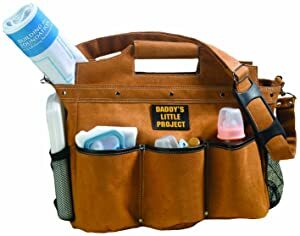 Not that it offers the kind of functionality that the daddy diaper bags offer, but this one offers a new twist to a handyman’s tool pouch. If you are the kind of dad who always has a handy bag around for whatever things you need, this diaper bag is just the right one for you. The functionality of this diaper bag is sacrificed by the lack of zippers. As such, you can be sure that somewhere along the way, any one of your baby things could certainly wriggle out of the bag. It has the type of construction, which suggests a bag that is built for the indoors. The fashion sense aside and compliments from your friends notwithstanding, this one is simply not even worth considering when you plan on taking your baby things for a long ride outside of the house.